It's Not Your Run of the Mill File Folder Activity! If your students on the spectrum are able to play in simple sequential patterns, such as placing a figure in a car and pushing it, or putting a car on a garage toy and making it go down the ramp, then they should have the language to talk about it! Do they? Communicative frustration is a very important factor to look at in students with behavioral issues. Wouldn't you be frustrated if you weren't able to make your needs known? There are many other factors, as well, but expressive language skills will be the focus today. If you are interested in learning more, I recommend reading some of V. Mark Durand's work on functional communication and behavior, such as this: http://www.goodreads.com/book/show/3963649-severe-behavior-problems. 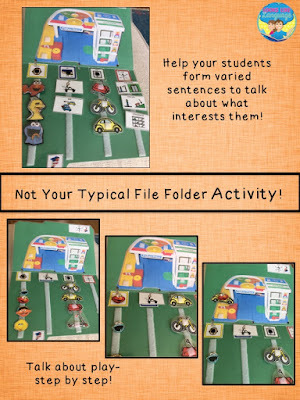 I have had great success with students producing basic sentences to talk about preferred activities using visually supported, interactive file folder sentence activities. This method has worked with verbally limited students a well as those who are nonverbal AAC users. The first step is to make sure that your student understands the visuals you are using. Make it fun! 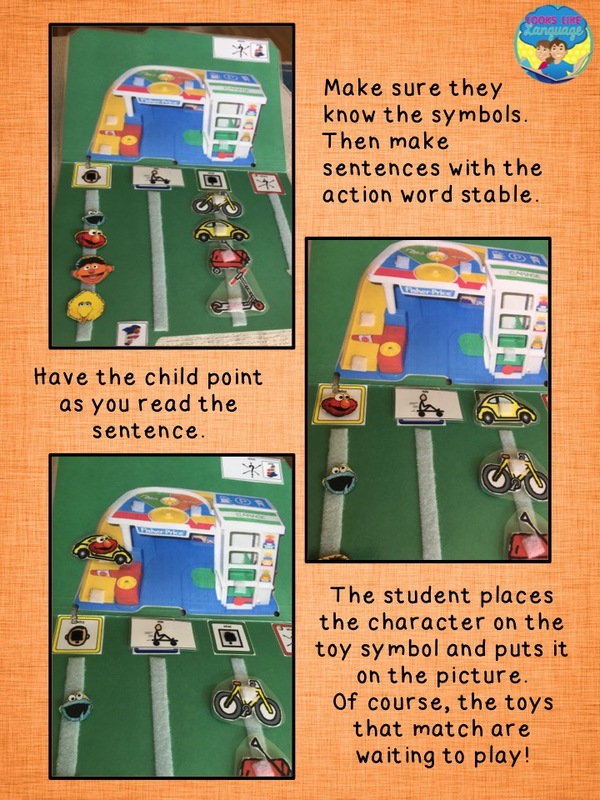 Just have the students request the toys and figures to play with, either verbally or using symbols. Rather than giving them the toy they asked for, give them access to the toys and say something like, “Sure! Take it!” You will see if they understand when they are taking what they requested. My favorite way to start implementing this technique is in combination with toys I own and the students can play with. If your student plays with the toys first, forming sentences afterwards to talk about what happened during play, you are actually teaching narrative skills as well! 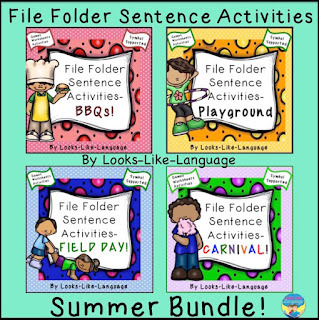 Some students will do better if they form the sentences first, knowing that they get to play when the file folder activity is completed, and that is fine, too! The graphic shows the steps I take to build the sentences for students with limited skills. I have found the most success with using a backward chaining pattern. For example, if I start with 3 symbol sentences, the character and the symbol ’ride’ will already be placed on the top sentence strip. All the student does is choose the toy by placing the symbol on top and point to each symbol in the strip as you read aloud. Then the character head gets placed on the toy and the whole thing goes on the garage. When all of the Velcro strips in the garage picture are filled, it is time for a play break! If the student did that easily ad is still showing interest in the garage, I might have him place 'ride' and the toy symbol in the top sentence strip in the next round. Be sure to start where the student is successful, work to a little higher level each session and end the activity while the student is still engaged! For higher level students, the top picture adds all of the choices that might be used to make sentences about playing with the garage. 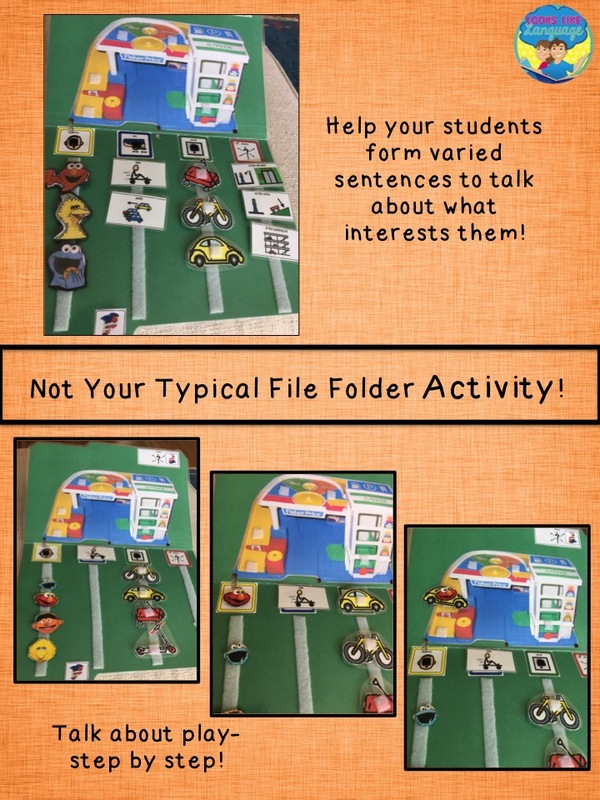 If you take pictures of your student’s favorite toy set, making a customized interactive sentence file folder activity is easy enough to do! If you prefer ready made, check out mine here. I hope this gave you some useful ideas! Are you interested in more helpful therapy tips and freebies? Subscribe to the monthly newsletter by entering your email on top, visit on Pinterest, Facebook and Instagram: @lookslikelanguage. This freebie has been updated! You can get it here. 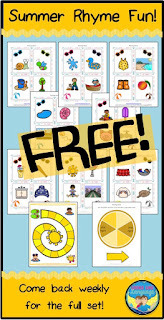 You Will Love the Descriptive Language in this Fun Activity! Do your younger students want to go outside, but you don’t think that is the best setting for them? Well, I’ve been there and have a fun, language packed activity that brings the OUTside IN! 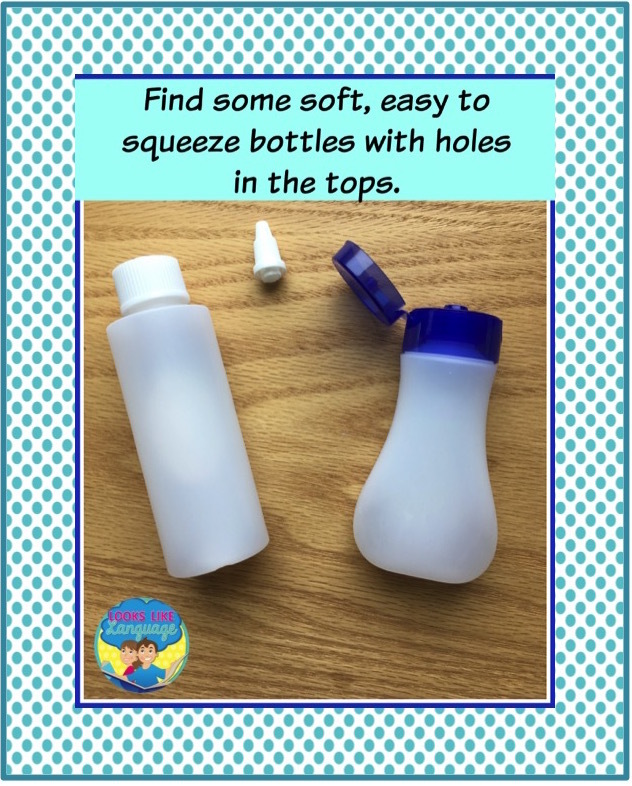 Did you ever try flying a kite with a squeeze bottle? Now, I have to be honest with you. I read about this in a magazine years ago and it absolutely does not do what those authors said would happen. But, you can elicit so much language and have such fun in a hands on activity, that I think you should give it a try anyway. 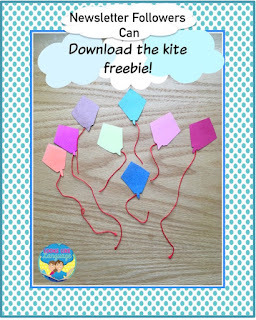 First, have your students color and cut out small kites. 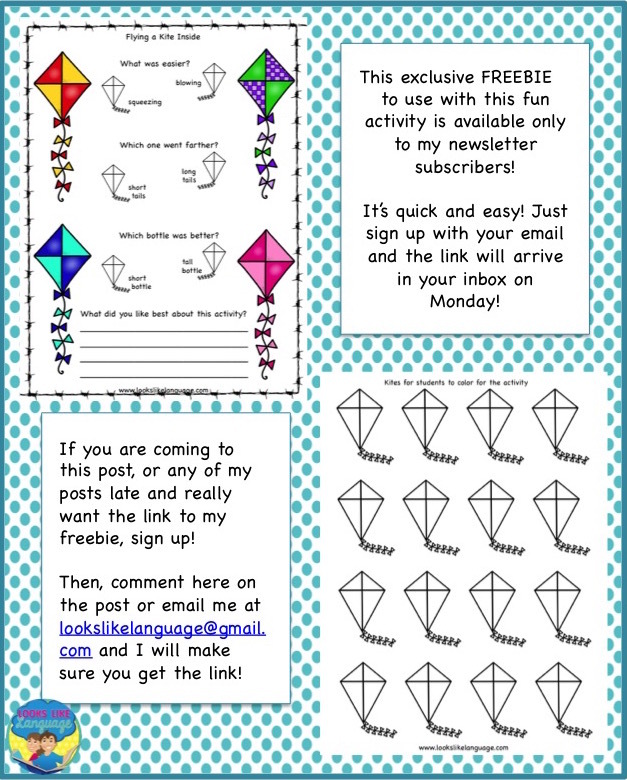 I've made an exclusive freebie for this activity (the link will be in the newsletter) but you can easily cut them out of construction paper, too. Cut a piece of string or yarn to make the tail and tape it on. If your kites won't stay in the bottle, just cut a little point on the bottom edges so they will stay in a little longer. 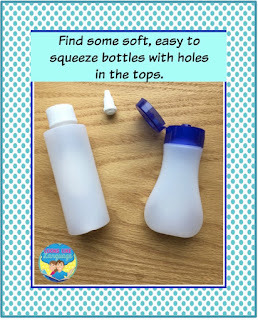 Then you need a small bottle that is easy to squeeze. I found two kinds in the travel section of a local drugstore. The short bottle had a hole already, but I had to cut off the top of the tall bottle so that I could push the kite string inside. 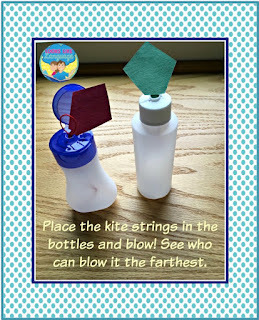 When you squeeze the bottle, the theory was that you can make the kite fly. In reality, it just kind of flutters down to the ground. 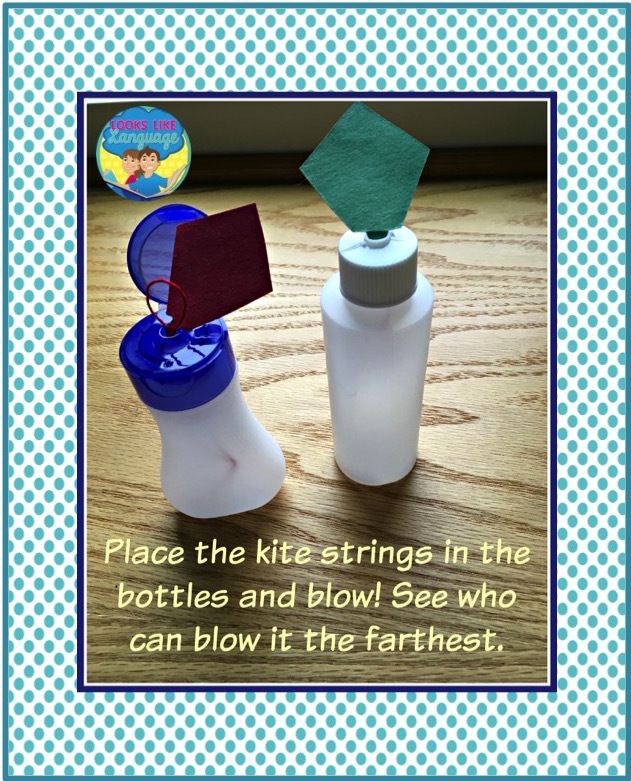 However, when the students hold the bottle and blow on the kite, then it actually will fly across the room a short way. My students had great fun and I had so many opportunities to model and elicit descriptive language. Which bottle do you want, the short one or the tall one? Which color kite do you want? Did you want the red kite with the long tail or the short tail? What happened when you squeezed fast? Slow? Hard? Softly? What about when you blew the kite? Which worked the best? The worst? If all of your students stand on the same footprints to 'fly' their kites, you can also compare. Whose kite flew the farthest? The shortest? The highest? Straight? To the left? To the right? Did the longer strings go farther or the shorter ones? Did blowing hard and fast work better or long and slow? Be sure to get my FREE, exclusive download by providing your email at the top. I promise, no sharing it, no spam- only quick weekly emails with my news and freebie alerts! 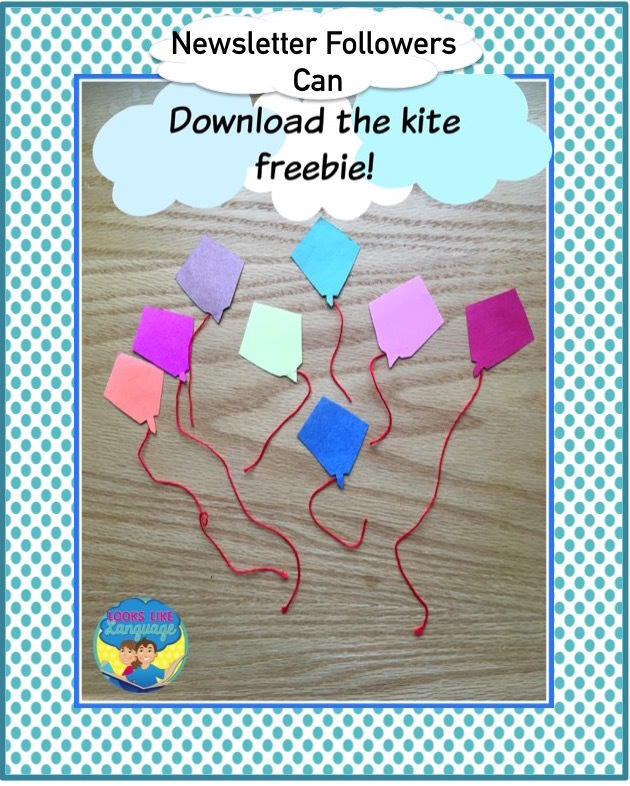 Whatever your kite flying results are, I guarantee that your students will be talking and having fun bringing the OUTside IN! The Frenzied SLPs are linking up for the downhill slope! 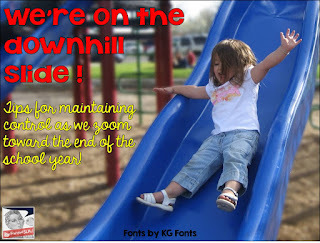 While downhill is usually the easiest and most fun part of the ride, at school it does bring some extra challenges. Many SLPs are drowning in paperwork. Most of us are juggling meetings and therapy. Then, there’s always the cleaning up, reorganizing and sometimes packing up for the summer that needs to be done. This time of year, I like to loosen things up a little and get away from the therapy table as well. So, I went looking online to find some activity ideas (by skill used) to adapt to meet the needs of my caseload. I think that ESL teachers may have the best job ever- teaching kids with normal neurological skills to talk! Many ESL sites share fun ways to get kids talking. 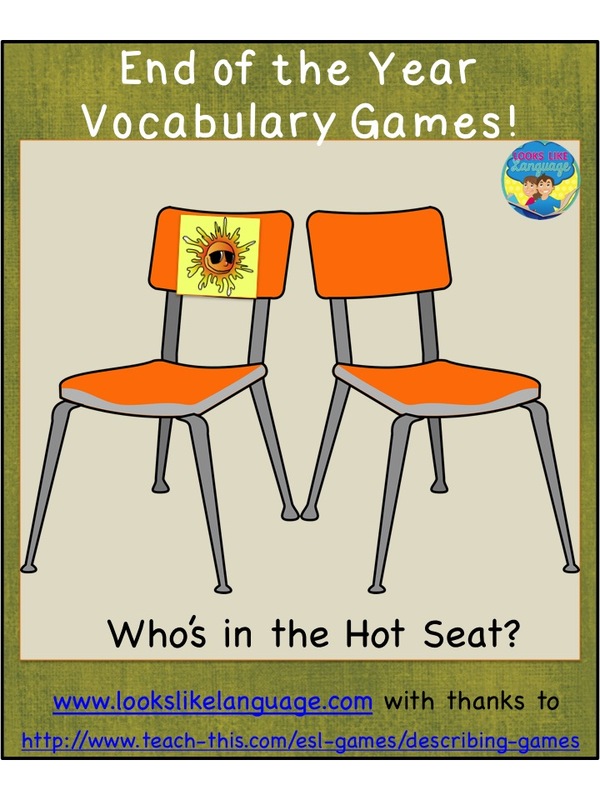 Here are two ideas that I’m looking at now for descriptive language from the site http://www.teach-this.com/esl-games/describing-games. 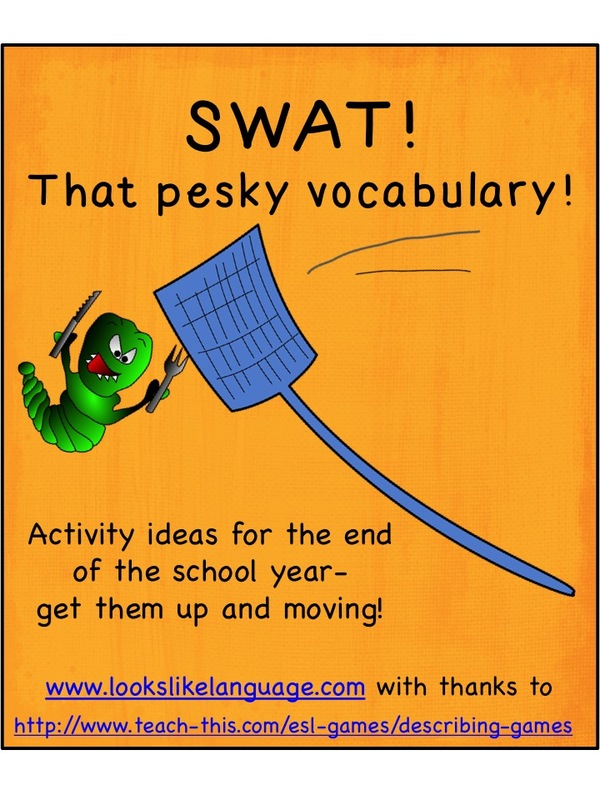 I am thinking of adapting the ‘Swat’ game for my lower level groups and using pictures of words they have learned this year on my board. The first week, I will provide the descriptions and they can swat the words off the wall or catch it on the sticky hands I found at the Dollar Store. The next week, they will get to be the SLP, taking turns giving clues to each other to find the words. To keep them from purposely giving limited information, I challenge them to give better clues than I did, making their combined score of words figured out on the first clue higher than mine was the week before. Games like this let the students use their skills, have fun, and let me do some mindless paper filing/recycling while I am interacting with them, cueing as needed and monitoring their carryover skills. 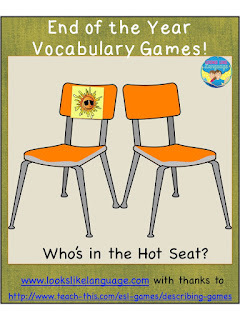 For my higher groups, the game I am going to try out from this website is called ‘Hot Seat.’ I will adapt this version of a vocabulary game by having the student who is giving the description write the word on a small white board. (If you follow me at all, you will have seen pictures of my favorite dollar store deal before!) The student has to give descriptions of the word that was written on the mini board until the student in the hot seat guesses the word. Then, they switch seats. Since I don’t have teams, I like to change the rules a bit so that my students are both motivated to keep trying and to not become frustrated. To do this, I will limit my students to 5 clues to get the other to guess the word. If they go over, that round ends. If they get the other student to guess the word, they get a point for each word. The students will alternate chairs, the ‘hot seat’ being the guesser, each round. For some groups, I may start with a category or a subject area to make the job of the student in the ‘hot seat' a little easier. So, what are your pet peeves this time of year? What is your most difficult time of year? Mine is the fall. Soooo hard to get back to work. But now, we have a long, wonderful summer to look forward to! For more ideas to help you make it to the summer, check out these links! SLPs, It Is Time to Feel Appreciated! Hi Y’all! If I sound a little southern it is because I have been hanging out at Mia McDaniel’s store, looking at all the great choices and deciding what to put in my shopping cart. 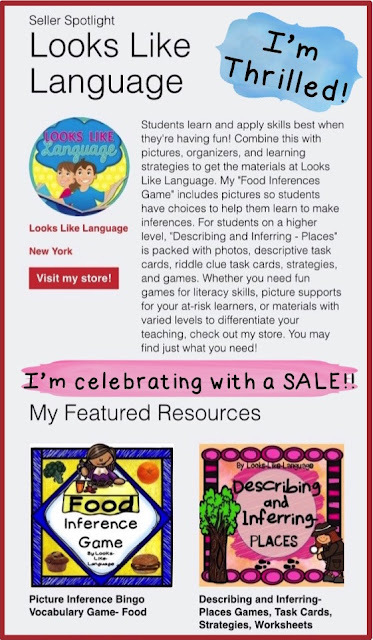 TpT sitewide sales are so exciting! I think we all deserve to treat ourselves and feel celebrated, don’t you? The Frenzied SLPs, with special thanks to Jennifer at SLPRunner, are hosting this linky and hoping that you feel celebrated! Don't forget to use the code CELEBRATE when you shop to get the extra discount! At Mia’s shop, I put her Reading & Responding Interpreting Language with Text Messages into my shopping cart. I own some of Mia’s other fun products and my students love them. I know they will love this one, too! 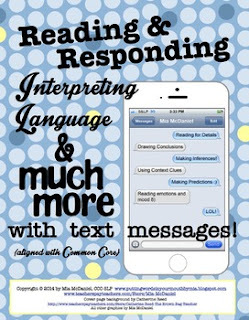 With text messages, the amount of reading required is short and sweet, as well as being motivating. So many functional language activities are targeted in this packet and I couldn’t resist that cracked phone screen! Then, I headed over to Small Talk Speech and put Take Out Topics in my cart. While most of my caseload needs help with conversation, I have some students working on carryover of the /r/ sound, too. This fun set lets me address both goals! An added benefit is that the clip art isn’t too cutesy for my older students! Finally, I stopped by Susan Berkowitz to get a new activity for my older life skills students. I like Life Skills- What to Say and Not to Say in the Community because it covers such an important life skill. The picture cues will help my limited readers to organize what to say. I like that includes a variety of ideas, as well as reasons, for saying/not saying things in situations. It is a treat for me because I don’t have to think of all the situations I need to discuss- I can just interact with my students! I just love having some new, fun activities to help me get through the end of the year! Don’t you? 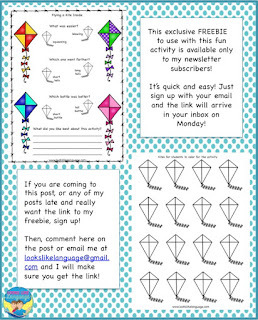 I have some fun, new activities to share, too! 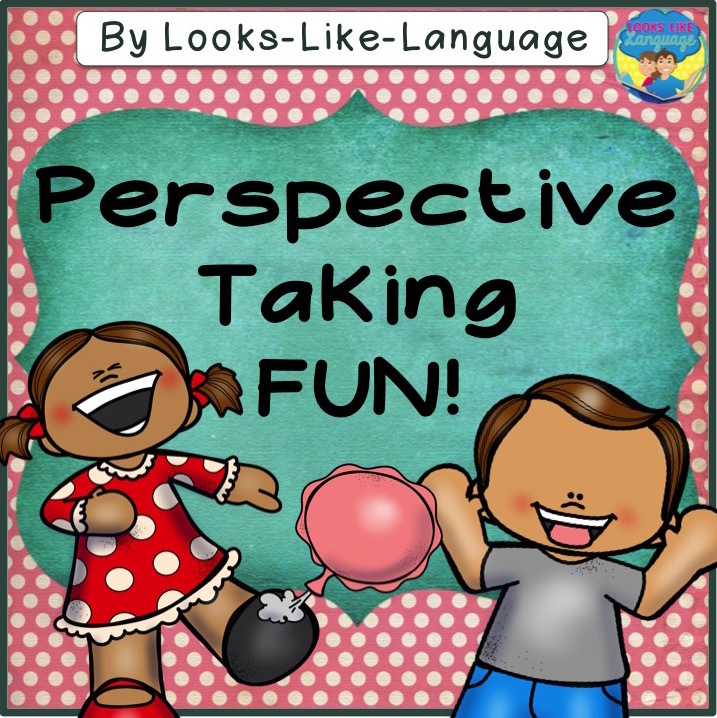 Perspective Taking Fun uses cute clip art of kids playing pranks on each other! Students love to play pranks and this is a very concrete way to start your kids on the spectrum thinking about how people have different perspectives. I love that they can interpret the body language and facial cues in the clipart to determine the kids’ perspectives on the jokes. I included thought bubbles to give them practice making statements from another point of view, worksheets to compare their points of view to the pictured student, and provided an emotions mini poster to help out with vocabulary. This activity also opens the door for your students to discuss their opinions with each other, and use some flexible thinking to determine what kinds of jokes are ok to do and what kind aren’t. Hot off the presses! 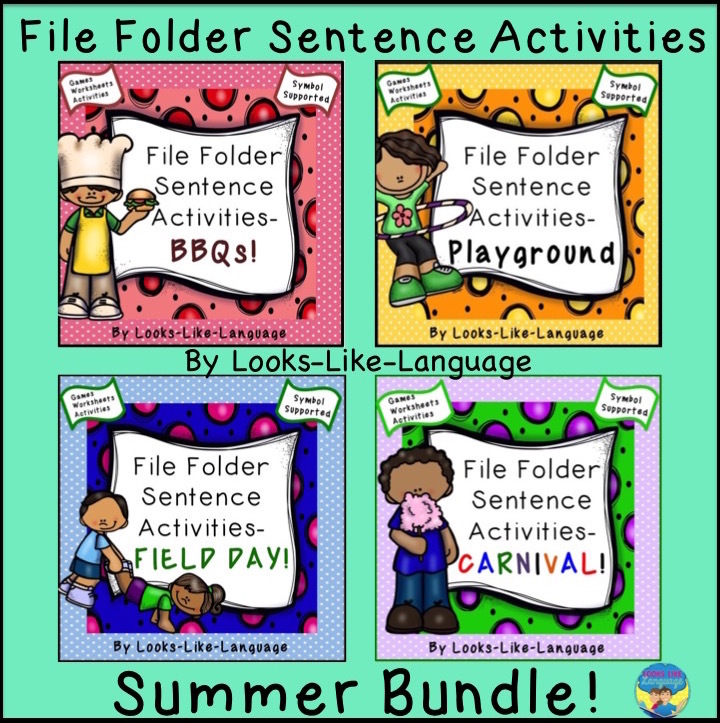 I've been really busy working to complete a new set of file folder activities for verbally limited kids and AAC users with a summer theme. I managed to finish 4 sets AND bundle them for you, too, so that you could get some extra savings! I worked for many years with nonverbal and minimally verbal students on the spectrum using low tech AAC. After my students were able to request their basic needs and label familiar objects, I started to explore ways to get them to comment and communicate using simple sentences. Verb use is more difficult to teach, but I found that it certainly was possible to do! 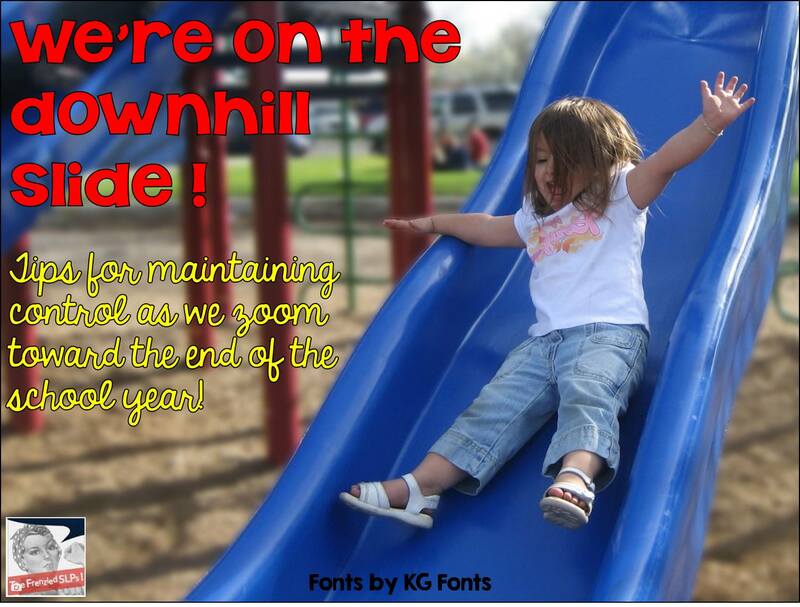 One of the formats I used is the one that is in my new File Folder Sentence Activities. 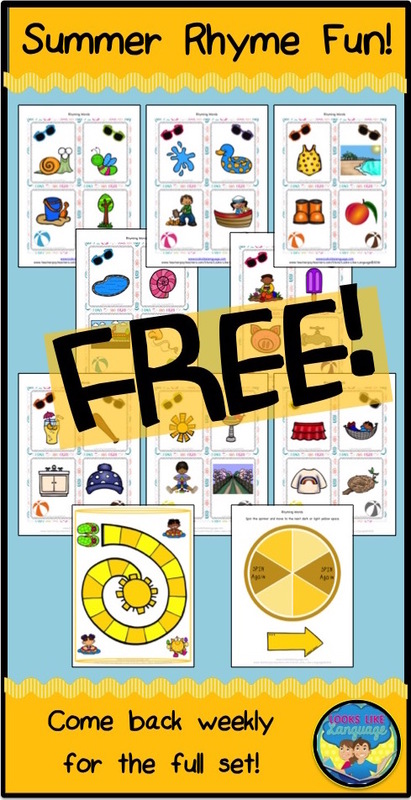 I’ve made sets for 4 fun summer events (playground, field day, carnivals and barbecues) to help your students communicate all summer long! You know that I always want my packets to be helpful, so please check the previews to be sure it is right for you! 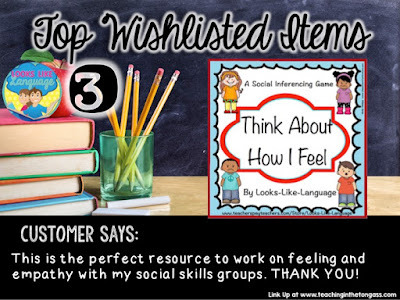 I hope that you feel appreciated, and that you find the item that is just right for you! Then, treat yourself! You work hard! There’s a lot more suggestions to help you find just what you are looking for. Just hop right over to The Frenzied SLPs! Are you interested in more helpful therapy tips and freebies? Join the free weekly newsletter or visit on Pinterest, Facebook and Instagram: lookslikelanguage. Make Sure Your Wish List is Complete! 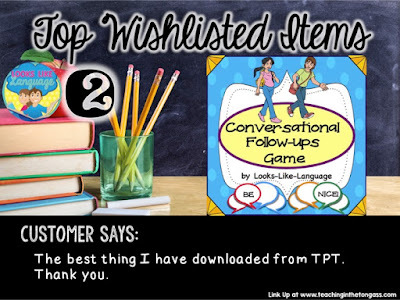 Thanks to Jen from Teaching in the Tongass for hosting this linky to celebrate Teacher Appreciation Week and the TpT 10th Anniversary sale! 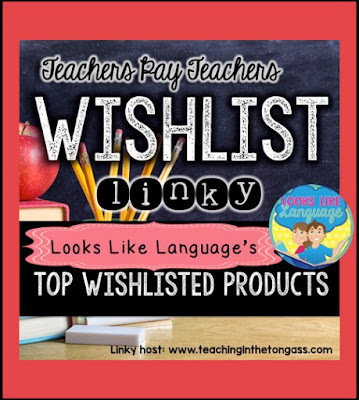 We are sharing our top wish-listed products with you today! Being a part of TpT is an incredible, and incredibly busy, experience! I really appreciated this opportunity to go back and look at all of my feedback on these packets. Seeing it all at one time made me feel so warm inside, knowing that I am helping you and the students you provide services for! I am so glad that my many years of experience, creating my own materials, can benefit others. Here are the stories of how these packets came to exist! I started researching how to develop conversation more functionally when I was working with students on the autism spectrum who were verbal, but had limited use of their language in functional ways. 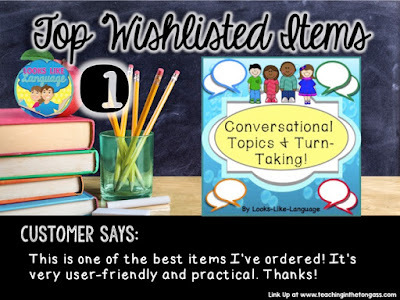 Conversational Topics and Turn-taking, my most wish-listed packet, helped my students on the spectrum move from just reciprocal turn-taking (responding "I like _." followed by “What do you like?”) to actual simple conversations with peers. 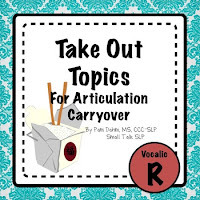 It provides topic cards with visual supports in a progression that helps students see what is expected and to practice the skills. This feedback says it can help your students, too! The second of my most wish-listed sets is Conversational Follow-Ups. This packet came about when I was working with middle school students, some who were on the spectrum and some with emotional disorders. They had so many skills in place to be able to interact with each other, but really lacked the perspective taking skills to think about why their peers would make certain comments to them, and what type of response they needed to provide in return. Showing them the types of responses that could be given, discussing what might be the best type of response for varied scenarios and practicing answering in a game format really helped my students to start thinking about how they replied to their peers! The increased variety of response they could provide helped them engage in more conversations and begin to get into conflicts less often. have basic vocabulary for emotions, but lack the synonyms that help them distinguish degrees of emotion. I developed this packet to have a set of materials to help them develop this skill, starting with understanding that there are degrees of emotions with words to distinguish how strongly people are feeling. The cards with facial expressions to practice interpreting the nonverbal cues that indicate our emotions. The next set of cards, describing familiar situations, requires students to take the perspectives of a child in this situation to tell how they feel, choosing a synonym that expresses how strongly they might be feeling in this situation. The next skill worked on is determining emotions from statements that a student is thinking, requiring more inferential skills than being told the situation does. Students having problems in these language areas may demonstrate difficulties interacting with their peers, whether it is a reluctance to interact at all or a tendency to get into conflicts. Academically, they may demonstrate difficulty understanding the plots of stories that involve characters’ feelings, interactions, and changes in these from the beginning to the end of the story. They may be able to memorize historical facts without comprehending the teacher’s explanations of why these events occurred. Whatever is on your wish list, I’m sure you will find some great materials during this sale! Be sure to link back to Teaching in the Tongass to get more ideas! Thanks, Jen! Are you interested in more helpful therapy tips and freebies? 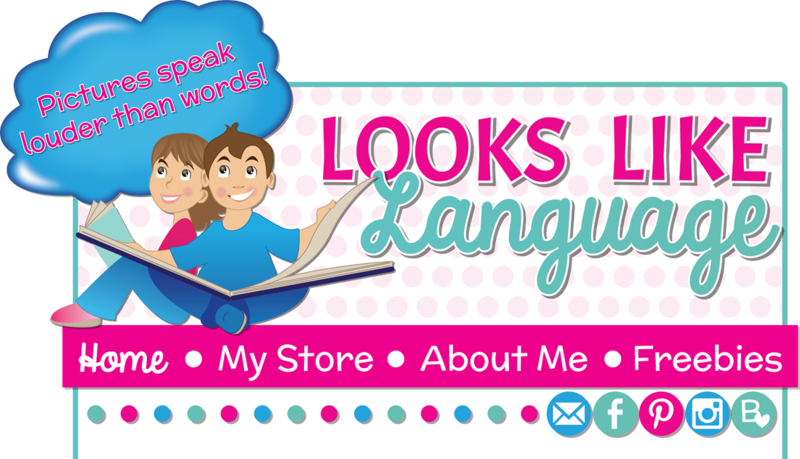 Join the free weekly newsletter or visit on Pinterest, Facebook and Instagram:lookslikelanguage.